M. Asam Aqua Intense™ Hyaluron Body Cream 16.9 fl. oz. 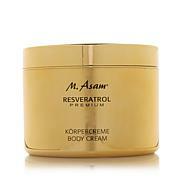 M. Asam Collagen Boost Body Cream 10.1 fl. oz. This silky, fragrance-free body lotion cares for your skin with our patented hyaluronic acid complex, silicium and shea butter. M.ASAM AI HYLALURON BODY LOTION 25.4 FL. OZ. This is the most moisturizing and so easy to apply especially to the legs and arms. Also no strong odors, just very pleasant mellow and enjoyable to apply as goes on so easy and goes in fast so no drying time. I need to keep stocked up on this one, as never want to be without this treasure. This is the best body lotion I have ever tried. I can see a reorder in my future. Absolutely love this lotion!Light and moisturizing! FINALLY! A lotion/cream that works! I have tried EVERYTHING on the market in an effort to discover THE lotion/cream that brings just the right amount of moisture, nourishment, healing, and non-greasiness/stickiness. I have found it in M. Asam's Aqua Intense Hyaluron line! This stuff is brilliant. A little goes a long way AND it's very economical to boot! 5 stars for sure!! I m pleased with this product I use it daily and love how my skin feels no heavy perfume smell either, I love the large container since I use so often this will last me a while. For nearly 50 years, this family-owned German company has created fine cosmetics and anti-aging products with the power of grapeseed oil. One of the most successful TV shopping brands in Europe, M. Asam now brings its grape-based products into your home. Remind me about M. Asam upcoming shows.